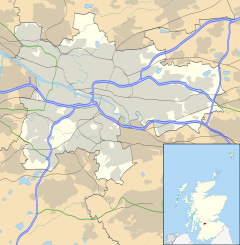 Milton is a district in the Scottish city of Glasgow, situated north of the River Clyde. The housing scheme is about 2.5 miles north of Glasgow City Centre and forms part of the northern edge of the city's urban area. The construction of Milton started in the late 1940s as a part of a general post-war construction programme by Glasgow Corporation to deal with housing shortages and slum clearance. The district is bordered to the south and east by Ashgill Road, dividing it from the older Parkhouse neighbourhood. It is also bordered by Liddesdale Road, which had previously connected Colston to Balmore Road. The new streets were named after the Scottish islands: Berneray, Birsay, Castlebay, Cathay, Egilsay, Longay, Mingulay, Ornsay, Raasay, Ronaldsay, Scalpay, Scaraway, Shilay Skerray, Stornoway, Torogay, Vallay and Westray. The area had only a few private homes (in Liddesdale Road/Birsay Road and Loskin Drive) prior to the new development. The initial scheme was completed in 1952. More housing was added in later years, including high-rise flats in Castlebay Drive in the late 1960s. Housing styles varied from gray stone apartment houses with back and front doors, to brown or white clad pre-fabricated apartments and 4 storey flats of 8 units each, some with open verandas. All housing was rented social housing. In the late 1980s, many of the flats in the area were replaced with social housing units more suitable for urban living. The last of the original flats in Scaraway Street was demolished in 2006 and parts of the area stand desolate. Children attend the merged St. Ambrose and St. Augustine's schools known as St. Monica's (Milton) Primary School. This holds Milton's Community Campus. Catholic and Methodist churches are located in nearby Liddesdale Square. The Methodist Church shares a Minister with the Methodist Church in Kilsyth and Colston Milton Church in Egilsay Crescent (Church of Scotland). The Church of Scotland Manse is located on Birsay Road. The scheme suffered from poor social planning. Pubs, cinemas or community amenities were accessible only by bus/car. A community centre was built in Liddesdale Road in the early 1970s. No factories or industry offered jobs in the area. The scheme was part of the Maryhill parliamentary constituency and is now within Glasgow North East. The four shopping areas were Skerray Street, Scaraway Street, Westray Circus and Liddesdale Square. Buses 8, 29/129, M3 and 75 serve the area. Community activists successfully campaigned to prevent the conversion of the site of the demolished Saint Augustine’s Secondary School into housing. Its future remains in doubt. LoveMilton, a community development trust for the area, obtained planning permission for a multi-purpose, community facility. Kenny Dalglish (Celtic and Liverpool), whose first team played on the spare ground at Egilsay Street and was called "Milton Milan"
^ "Overview of Milton". scottish-places.info. ^ "Glasgow Corporation Housing Department (later Architectural & Planning Department, Glasgow Corporation)". ^ "A Social History of Problematic Substance Use" (PDF).